What now we call the Brazos River has had many names. Some sources say the Indians called it Tolonohono, sometimes translated as mighty waters of the Tejas. What we now know as the Brazos River was probably the same body that the members of the LaSalle expedition called the Maligne, and it may be the river that the Espinosa expedition called la Trinidad. 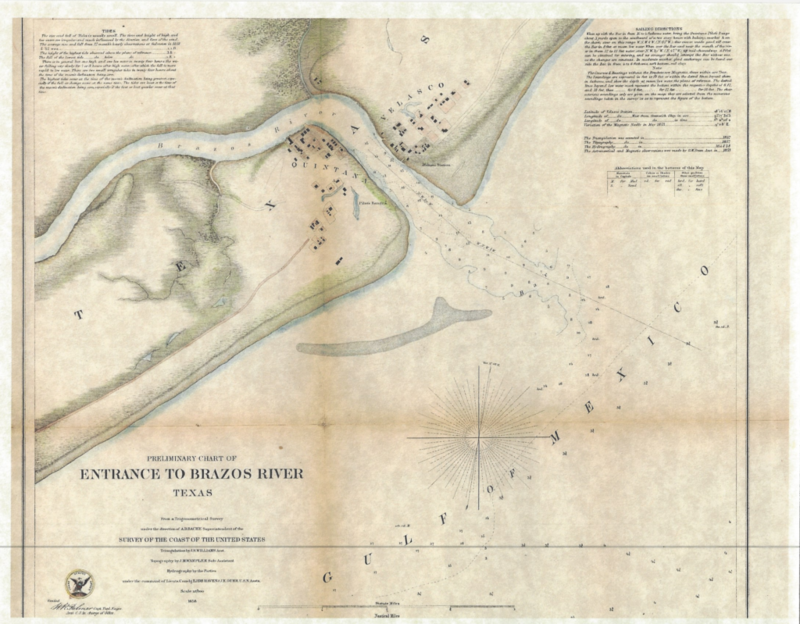 A common thought is that some early explorers (and mapmakers) confused the Brazos and the Colorado, so what we now call the Brazos was originally the Colorado. The red color of the Brazos at flood stage makes this theory quite credible. Many legends exist as to how Los Brazos de Dios got its name. Most involve the fresh water of the river saving sailors or explorers. One version credits Francisco Vazquez de Coronado and his men with naming it after friendly Indians saved their lives by leading them to a small tributary of the river. Other versions credit unnamed sailors lost at sea (or tossed about in a hurricane) until their water supply was exhausted bestowing the name after seeing and following the muddy discharge of the river to land and fresh water. Early Spanish explorers came mainly in search of gold, but LaSalle’s attempt to establish a French colony in Texas (1685) led to Spain’s establishing missions in Texas to strengthen their claim to the territory. The priests, however, had another mission. They wanted to make friends with the Indians and to convert them to Christianity. One day, according to the legend, one of the padres managed to gather a small group of friendly Indians (probably of the *Tejas tribe) and was leading them back to the mission when they realized they were being followed by a band of fierce Karankawa Indians. The padre and his small group of Indians tried to outrun the Karankawas, but they could not match the speed of the much taller Karankawas; and, if they turned to fight they knew they could not match the strength of the Karankawas. As the padre prayed for guidance they came to a raging river. The padre could not swim and he did not know if his followers could swim, but he decided the river was a better option than the Karankawas. He jumped in and his followers did the same. The moment that he hit the water, the waters rolled back. The padre and his small band of Indians rushed to the other bank with the Karankawas close behind them.